Impressive estate on the edge of Alaró village with roughly 960,000m2 of surrounding land, this is comprised of flat land farmed for hay, orchards - mainly olive, almond and carob, terraced areas and part of the highly protected Tramontana mountain range which is forested. The property is completely private with gated entrance and driveway leading to the house. There is roughly 1450m2 of registered living space which is divided between 790m2 of habitable space and 658m2 work space, stables, a mill and farm storage space. Additional to the 1450m2 is a further 550m2 of terraces and paved areas, plus roughly 220m2 of outbuildinsg - chicken houses, pig sty, sheep dens, etc. Internally, the main house has the grand main entrance, eleven bedrooms and five bathrooms, living / dining areas, original store rooms, pantry and kitchen. In the forested part is a 15m2 old hunting stone house. 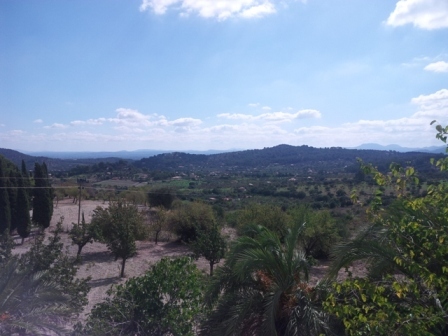 The house needs reforming throughout, is very well located with good views and close proximity to the village of Alaró. Easy commute to the International Palma Airport. A historically, unique property with its own chapel.For viewings, call us now!